Jackie, email or FB me which book from August you'd like and I'll be sending it on its way! The day Danielle Harding takes her 11-year-old son, Simon, and flees from her abusive husband, is the same day Kurt Harding dies. A relieved Dani believes she and her son are finally safe--but in reality, the danger has just begun. When Kurt was alive, he took something important to a mysterious person. That person wants the item back and believes Dani now has it. As she and her son run for their lives, they have nowhere to turn, until she hires Adam Buchanan of Operation Refuge and goes into hiding. Unfortunately, she won't be able to hide for long . . .
From the first breathless scene, this tension-laced story will hold readers in its iron grip. Bestselling author Lynette Eason propels readers along at a breakneck pace in a race to discover the truth and a better future. I'll admit, I have not finished this book, but it's not because I don't love it or Lynette Eason. It's because we've started school back up, and I'm still getting used to my new schedule. Fall hits harder every year. Anyway, my reading time is slim, but there are too many wonderful books out there to give up those few moments I have! So, I may be slow, but I will be finishing it soon. That said, as usual, Lynette Eason knows how to open a book with a bang. Nowhere to Turn is no different. She immediately drew me into Dani's life, and I can say my heart was pounding right from the beginning. While the tension doesn't remain that high (good thing, my heart couldn't handle it) there are still plenty of moments that will have you flipping pages as fast as the characters run through them! I'm excited to finish this story and figure out who's behind everything for sure. As I haven't read "The End" yet, I won't be handing out any stars. However, as of this moment, I'm definitely enjoying this book. What you need to know is while this is the second in Lynette's newest series, it is not imperative to read them in order. You'll also find Lynette's voice as strong as it's always been, so it's like opening pages to an old friend as she unwraps the story for you. If you're looking for a suspense that will keep you up at night for GOOD reasons, you'll want to pick this one up here. It's the weekend. You can sleep in tomorrow! I finished reading Nowhere to Turn and loved it. 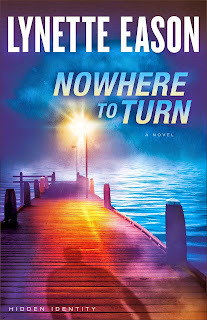 My one problem is at times it felt a bit predictable, and I couldn't place my finger on whether that was the storyline or the fact that I've read other of Lynette's Books. Still, she remains on of my favorite authors, and I will definitely pick up the next in this series and any other book she writes. I give Nowhere to Turn 4 out of 5 stars. I love Lynette's books. I didn't realized she had a new one out. Sounds great.